What started as a seemingly harmless public health issue in Brazil has now put Latin American countries, and even the United State on high alert. The Zika virus, a mosquito-borne illness, has far reaching epidemic potential with no cure in sight. Though a majority of those infected don't show symptoms, it is especially dangerous in pregnant women, as many believe it can cause serious birth defects. The spread of the virus has impacted conversations about prevention, travel and even health policy. HealthGrove visualized the spread of the virus, then examined how it might impact abortion laws in certain countries. Data from the Centers for Disease Control and Prevention (CDC), visualized by HealthGrove, shows the slow creep of the virus from the top of South America up to Mexico. According to the World Health Organization (WHO), at least 20 countries or territories in this region have registered active transmissions of the Zika virus. A small handful of cases have even been reported in North America and some parts of Western Europe, due to travelers who contracted the virus abroad and brought it back home. Only 31 travelers have returned to the U.S. with Zika virus infections since it was first detected in Brazil in May 2015. On Jan. 26, a Los Angeles woman who had traveled to El Salvador in November was found to have contracted the virus. As with most Zika cases, she didn’t exhibit any symptoms, and has since recovered. Luckily, the disease is not yet spreading locally in the country, according to a representative from the CDC. About 80 percent of people infected with the Zika virus don’t show symptoms at all. A member of the same disease family as the West Nile virus, yellow fever, Chikungunya and Dengue fever, the Zika virus is almost entirely spread by infected Aedes aegypti and Aedes albopictus mosquitoes, though a few cases of Zika transmission through blood transfusion and sexual contact have been reported. So why has it caused so much deep concern in the medical community? The virus has been linked to a surge of serious birth defects including microcephaly, a neurological disorder that causes abnormally small heads and brains. Among the first 35 cases of microcephaly reported to a task force and registry established to investigate Zika virus-related cases of microcephaly, 71 percent of babies (25 in number) have developed head circumferences smaller than three standard deviations away from the mean. USA Today reported that it has also been associated with “increases in Guillain-Barre syndrome, in which the immune system attacks the nervous system, causing paralysis.” Other birth defects include excessive scalp skin (31 percent) and club foot (14 percent). In response to what the head of WHO called the “explosive spread” of the Zika virus and its seemingly dangerous effect on newborns, many Latin American countries have strongly urged women not to get pregnant. 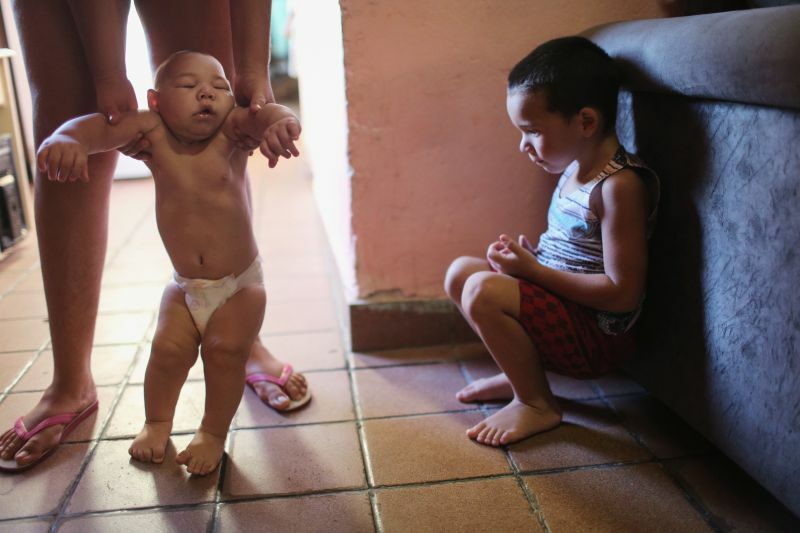 El Salvador, which has about 5,397 detected cases of Zika virus, was notably the first to announce the two-year pregnancy hiatus. According to Reuters, Deputy Health Minister Eduardo Espinoza of El Salvador announced that they “suggest to all the women of fertile age that they take steps to plan their pregnancies, and avoid getting pregnant between this year and next." Though the country asks for women to control their reproductive health, El Salvador has some of the the strictest reproductive laws in the world. In fact, according to 2016 data from the Center For Reproductive rights, it is one of four nations that denies women abortions regardless of circumstance. In a country where women can face prison sentences for miscarriages, this pregnancy haitus will most likely mean a strong reliance on birth control or abstinence. According to Vocativ, as of 2008, about 73 percent of women in El Salvador used some form of birth control, including female sterilization. Though this percentage is relatively high, they go on to explain that “the Pill requires a prescription and can only be sold in specific locations, and El Salvador offers extremely limited subsidies for condoms, making them unaffordable for poor families.” If the disease spreads as widely as anticipated, countries with strict anti-abortion laws such as El Salvador may require a policy change. The WHO predicts that three to four million people could be infected with Zika virus in the Americas this year and is taking precautions to protect those who will attending the 2016 Olympic Games in Brazil. The U.S. hopes to begin human vaccine trials this year. American's plague of gun violence claimed eleven lives Friday at two school shootings, in Santa Fe, Texas and Jonesboro, Georgia, marking the deadliest day of violence since the February 14 Parkland massacre at Marjory Stoneman Douglas High School. Medical Examiners have positively identified the dismembered torso as that of missing journalist Kim Wall, last seen August 10, 2017 standing in the tower with Danish Inventor Peter Madsen aboard his self-constructed submarine, Nautilus. Spring is that perennial time of renewal. Whether you desire to breathe new life into your personal care regime, beautify your home or add some trendy new styles to your wardrobe, here are some spring pick-me-ups that'll have you sitting pretty all season long. The Last Word, from Bleecker Street Media, presents a classic timeless story of finding the missing pieces that, through discordant beginnings, are fine tuned into melodies, that somehow find the right blends, the harmonies, that becomes treasured memories. President Obama spoke to the nation this week in his annual State of the Union address, capitalizing on his past successes he announced sweeping changes geared toward keeping the economy moving for stalled demographics. Manscaped, Inc., the world's #1 brand for below-the-waist male grooming, has started shipping, The Lawn Mower 2.0™ – an ergonomically-designed trimmer that redefines power, precision, and sensitivity, with snap-in blade replacement, it takes men's health and hygiene to a new level!